Facebook chatbots are exploding, and for good reason. They enable you to create sophisticated interactive messages that engage your audience where they hang out. Should they just duplicate what they’re doing on email? Should they send lots of promotional messages? Or avoid promotional messages? Just what exactly are the best practices for sending Messenger broadcasts? As one of the world’s leading providers of Facebook Messenger Marketing software, we’re in a unique position to be able to see what’s happening out there—what kind of broadcasts people are sending, which ones are working, and which ones aren’t. And in this post we’re taking all that experience and expertise to help you create better broadcast messages. Just follow the tips and strategies in this article and you’ll be on your way to generating sky-high engagement and sales through Facebook Messenger. So the first thing you might be wondering is, why should you send broadcasts through Facebook Messenger at all? Can’t you just send emails like you’ve been doing for years now? If you’re an email marketer, you might need to pick your jaw up off the floor. 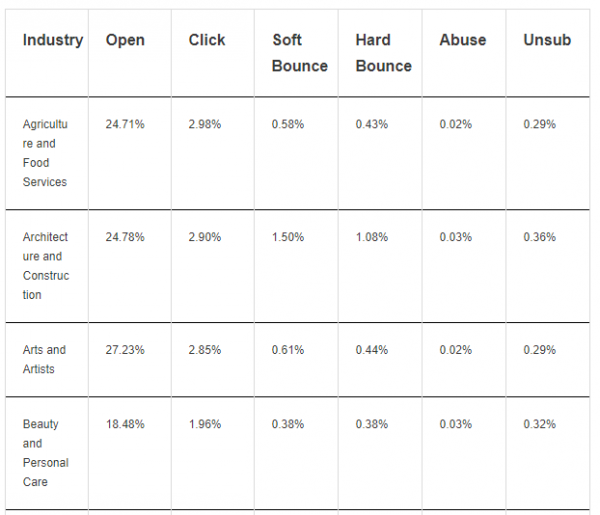 Yes, those are open rates of 66.06%-98.56% and click-through rates of 8.40%-72.73%. Yes, those numbers are fairly typical of what many marketers are seeing. So what do you think? Are you convinced yet? Then let me throw a few more benefits at you. With Facebook Messenger Marketing, because everything is tied to individual Facebook accounts, you don’t have to worry about your messages bouncing. You also don’t have to worry about people giving you a “bad” Facebook account (the way they use bogus email addresses on your opt-in forms). Also, Facebook Messenger inboxes aren’t as flooded as email inboxes…. And, most people are only using Facebook Messenger to interact with family and friends. This means that they actually USE Facebook Messenger and that they probably have push notifications enabled on their phone for when they receive a new message. 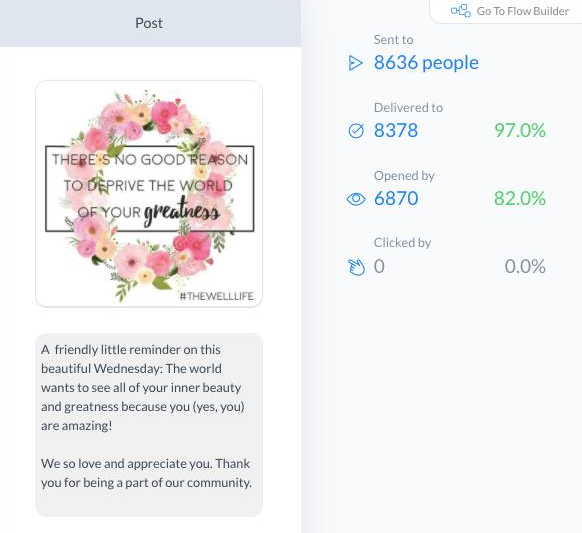 These are just a few of the reasons why marketers, entrepreneurs, and business owners love using Facebook Messenger Marketing. And a big part of getting the most out of Messenger Marketing is the strategic use of broadcasts. What Is Facebook Messenger Broadcasting? A broadcast is a one-off, manual message that you send to people on your Messenger list. Many marketers tend to focus on the automated side of Messenger Marketing. 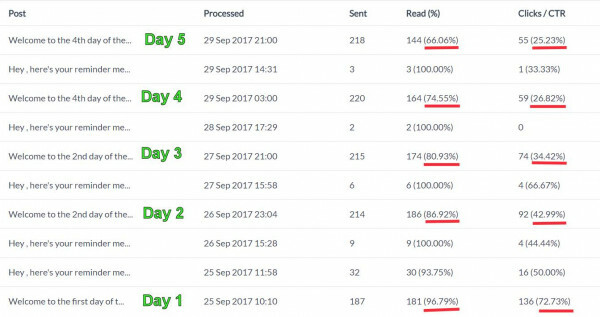 And it’s easy to see why: people love the idea of creating “set it and forget it” chatbots that will run on autopilot. But not everything can be automated. Sometimes you need to send an ad hoc message to let your subscribers know about an update, a piece of news, to ask a question or send a survey, or even just wish your list a Merry Christmas. 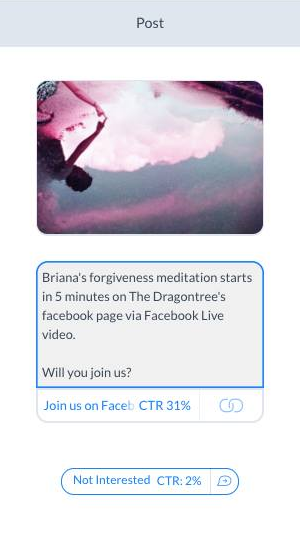 You can tag everyone who clicks “Join us on Facebook” with a tag such as “likes_meditation.” You can then send those users into a specific meditation-focused Messenger sequence that gives them more of the content they’re interested in. Why did Facebook create these rules? In short, they want to make sure their users have a positive experience when using Messenger. And part of having a positive experience means NOT being inundated with spammy promotional messages. 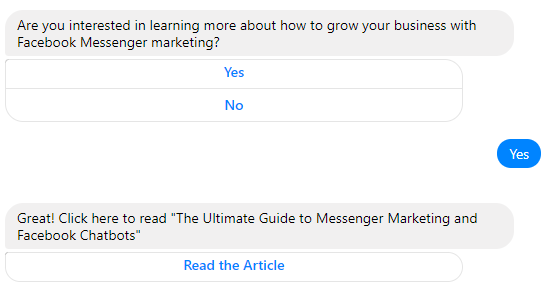 So yes, you are limited in how often you can send promotional emails via Facebook Messenger. but keep in mind the benefit of all those rules: when you do send a promotion to your subscribers, they will be more receptive because they aren’t being buried by ads from other marketers. 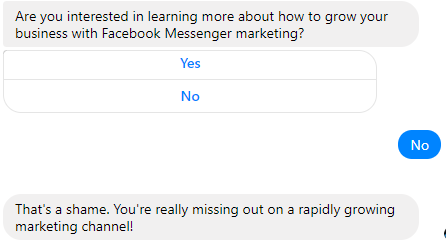 This is your typical non-promotional message, and will probably make up the majority of your Facebook Messenger broadcasts. Subscription broadcasts cannot contain promotions or ads, but on the other hand, you can send them anytime you want—regardless of your subscribers’ activity level. Here’s an example of a subscription broadcast—it doesn’t promote anything, but it does a great job of engaging subscribers and helping to build a relationship with them. You can also use subscription broadcasts that ask your subscribers questions. Based off of how they answer (which button they click), you can then segment them into a sequence where you COULD ultimately sell them something, if it’s a good fit. The key here is that you aren’t blasting them with promotional material right off the bat… you’re making it an interactive and individualized experience for the end user. 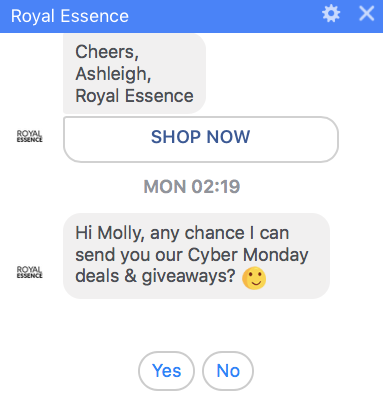 Instead of blasting a promotional message about Cyber Monday, they asked permission to send information about their deals. This is a broadcast that does contain an ad or other promotional materials. However, you can only send promotional broadcasts to subscribers who’ve interacted with you on Facebook Messenger in the past 24-hours. Once you send someone a Promotional Broadcast, you have the ability to send a follow-up broadcast 24-hours later. 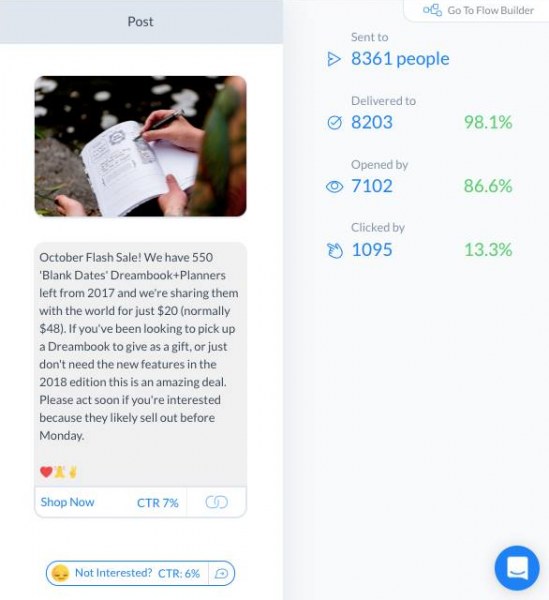 Once those 24 hours have passed, you won’t be able to send any more promotional messages until the subscribers interact with your chatbot again. Follow-up broadcasts give you one last chance to remind your subscribers about your promotion. 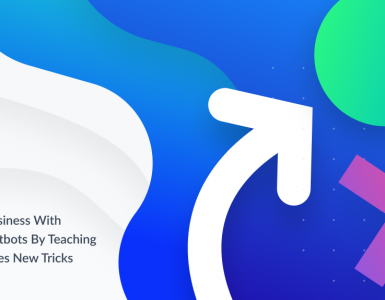 Now that you know what broadcasts are, when to use them, and what the rules are, let’s dive into actually creating your first broadcast message inside of ManyChat. To get started, click “Broadcasting” and “Broadcasts” in the menu on the left. Then click “+ New Broadcast” in the top right. This will take you to the Create Broadcast screen, where you can customize the content in your broadcast. 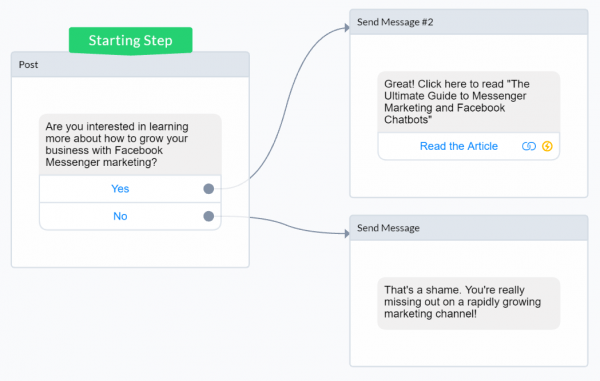 Keep in mind there are now two ways to build out your content: using the old linear builder, or the new Flow Builder. For this example we’ll be using the new Flow Builder. 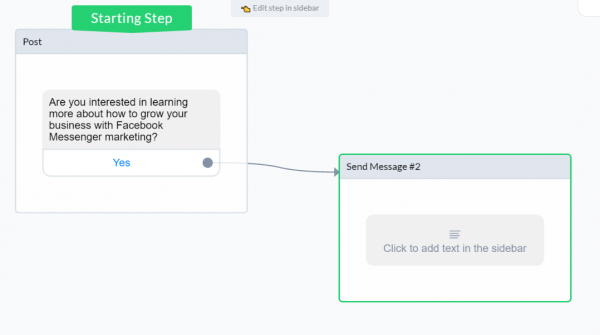 When you click on the “Go to Flow Builder” button, you’ll see a flow containing just one step—the Starting Step. Click on the post to bring up a sidebar where you can add content to the first step. 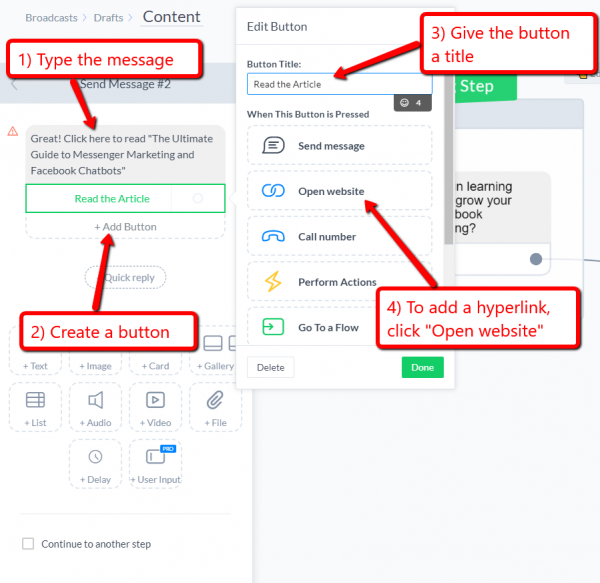 From here, you can add any kind of content you want—text, images, buttons, videos, and so on. 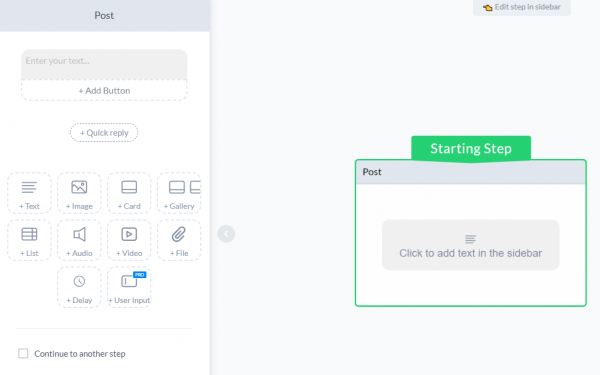 Now you just have to specify the button text and choose what you want the button to do—send a message, perform an action, or send the user to another flow. In this case, let’s create a “Yes” button that sends the user a message. And once again, just click on the new step to edit the message. 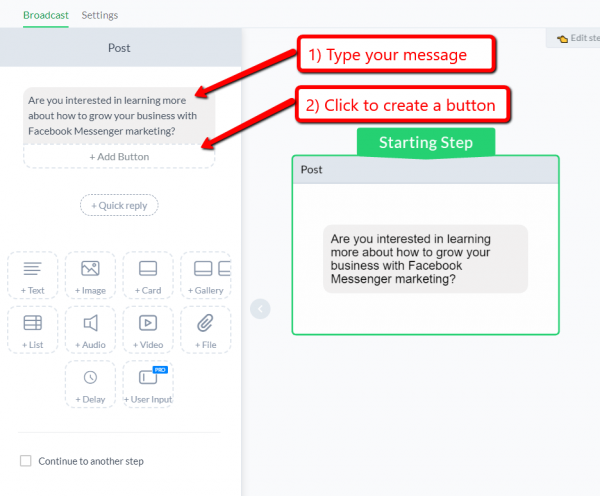 In this case, we’ll add a button that sends the user to a blog post where they can learn more about Messenger Marketing. The last thing you’ll want to do is preview your broadcast to make sure it looks the way you want. To do that, just click “Preview” in the upper-right corner. Perfect! Now that my broadcast content is created, I’m ready to wrap up the settings and send it to my subscribers. Next you’ll want to click the “Settings” button at the top of the screen. Message Type: We talked about the three message types above. Just click the type of message you want to send. Targeting: This is where you can determine who receives your broadcast. When you click “+ Condition,” you’ll see a list of targeting options. Schedule Broadcast: This is pretty self-explanatory. Choose whether you want to send your message immediately or at some point in the future. Timezone Settings: Here you can choose how to handle broadcast scheduling for users in a different timezone. Do you want everyone to receive your broadcast at once? Or do you want everyone to receive it at 9:00am in their local timezone? Notification Settings: Here you can choose what kind of notification you want to trigger on your subscribers’ phones. A “Regular Push” notification, for example, will make a sound and display a phone notification. By comparison, a “Silent Push” will display a phone notification without any sound. And that’s all there is to it—you just sent your very first broadcast message using ManyChat! Now that you know how to set up and send a broadcast in ManyChat, here are a few best practices to help you get maximum engagement and results from your Messenger broadcasts. 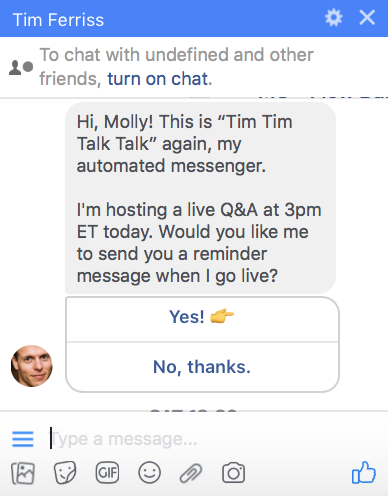 When you’re outlining a Messenger broadcast, you want the very first message to be quick and easy to read and respond to. Do NOT start out with a big, intimidating block of text. That will only put people off. Remember that your goal with the very first message should be to get your subscribers interested and engaged. Here’s an example of a broadcast that starts with a short, easy-to-read teaser message followed by a single button. The result? A 55% CTR. Don’t just give subscribers a single path to follow in your broadcast. Instead, give them lots of options to personalize their experience. Remember that people don’t want to feel like they’re being talked at by your chatbot. They want to feel like they’re interacting with it. Conversing with it. That’s why people expect Messenger messages to give them options. 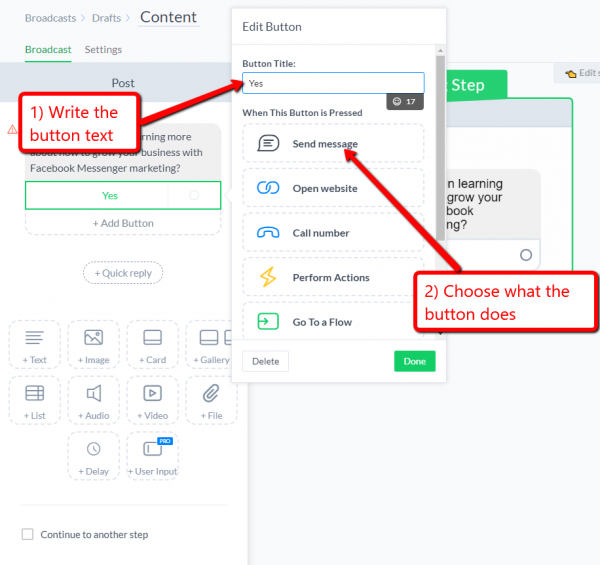 So give them what they want—lots of buttons with branching logic and personalized responses. Facebook Messenger isn’t a one-way, one-to-many communication the way email is. It’s a two-way street. It’s conversational. That’s why it’s best to avoid being super-promotional in Messenger broadcasts. Instead, it’s better to ask questions. Then you can go into a more detail sequence of personalized messages based on their responses. Eventually you can send them more information about a particular product or promotion based on their needs & interests. When you follow this strategy with your broadcasts, you’ll end up building more of a relationship with your audience. They’ll come to know and trust you, because you didn’t just ram a single product down their throats—you listened to them. If you’re excited at the possibilities of Facebook Messenger Marketing, I have some great news. You can start testing this stuff out right now, today, and it won’t even cost you a dime. ManyChat’s basic account (which allows for UNLIMITED broadcast messages) is 100% free. All you have to do is sign in with Facebook and you’re off to the races! Click here to sign up for your FREE ManyChat account and discover the power of Messenger marketing for yourself. Great Job guys….this is very helpful stuff! Nice. But …. once you give Sequences Conditional Logic then that’ll be a REAL game changer.